Atlanta traded their franchise cornerstone Ilya Kovalchuk. You've heard about that, no? In return the team receive a pair of younger players that can pitch in now, a top prospect, but not the top prospect, and a first rounder. 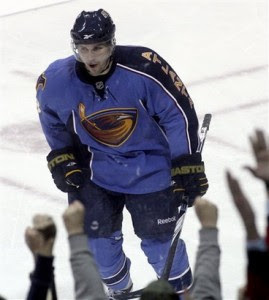 Thrashers fans may not have been thrilled with the return, but, if not, what did you hope for in a rental situation? Once Kovalchuk was dealt, it was/is only a matter of time until most, if not all of Atlanta's impending UFAs are traded away. Another number one pick by the Thrashers, goaltender Kari Lehtonen, was traded to the Stars for defenseman Ivan Vishnevskiy and a fourth-round pick. Conversely, Thrashers fans should be universally happy about this deal. Lehtonen has career numbers that indicate that he can play; however, he has become so injury prone that he cannot be counted on. Lehtonen had no appeared in a single game this season for the Thrashers. He had become of little use to the team, but in return Atlanta received Dallas' top prospect and an additional draft pick. Next up? Defenseman Pavel Kubina and forward Colby Armstrong. Both will be in high demand, particularly Kubina who will fetch another attractive return. 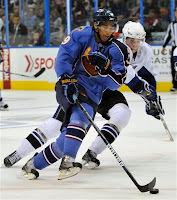 Speedster Max Afinogenov, whom the Thrashers picked up off the scrap heap, could also be dealt, as could Slava Kozlov. What makes all of these moves unusual? The team is still contending for a playoff spot. GM Don Waddell has had the unenviable task of trading away the franchise, functioning as a deadline seller, while trying to bolster the team's remaining core and adding pieces to prepare for the stretch drive to the post-season. It's a lot, and the amazing part...he just might do it. All is not lost in "Blueland". Teams could do a lot worse that to build around Evander Kane and Zach Bogosian. Atlanta has long-term pieces in Oduya, Hainsey, Antropov and Bergfors (who will be a RFA). 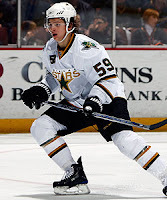 Waiting in the wings are Cormier, Vishnevskiy and Klingberg. They will enter next season with a bevy of draft picks, young players and cap room galore. Could they chase Kovalchuk again in July? Maybe they use the cap room to sign a franchise netminder by paying for Evgeni Nabokov and don't forget super sniper Patrick Marleau, who is just one year older than Kovy will be an UFA also. It just might be a fire sale is just what this franchise needed.